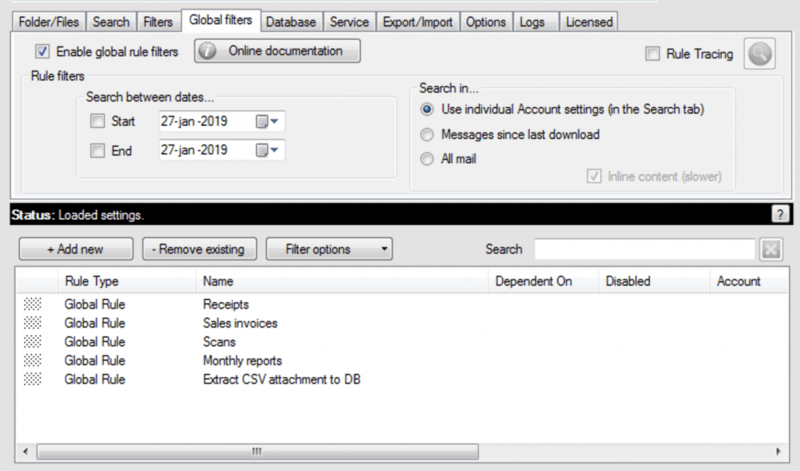 Mail Attachment Downloader PRO and PRO Server editions offers email filters to configure the program to process emails and attachments in different ways. This gives an introduction to Global Filters and explores some of the new features introduced in PRO Server v3.2 build 978. For an overview of how to save emails and attachments in specific folders please refer to this post before reading through this one. 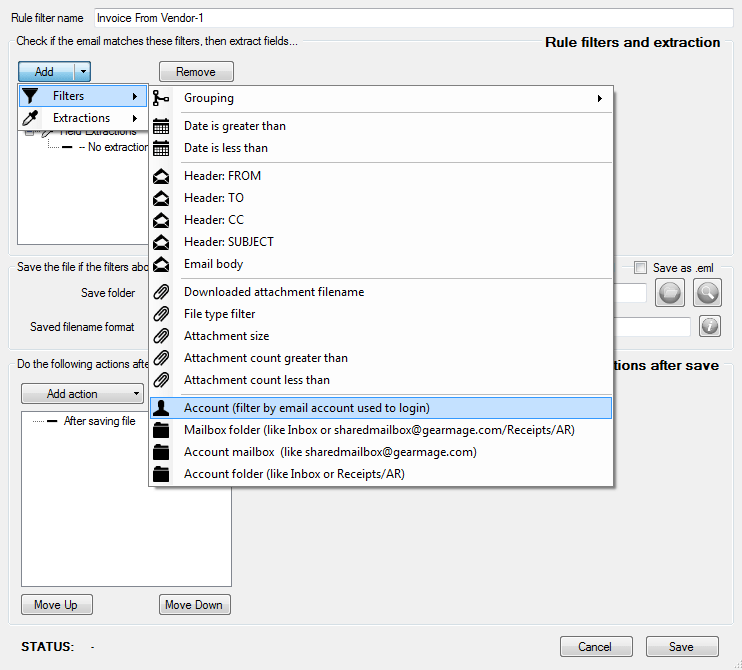 The global filters are a set of rules you can create in the Global Filters tab as shown below. This is only available in the PRO and PRO Server editions of the product. Global filters apply to all configured accounts in the program (under the Account dropdown). Note that to download from multiple accounts, you must pick ‘multiple@multiple’ from the Account dropdown. Otherwise the download will only run for a single account. When is a global filter run? For each attachment, a global filter is run to see if any filters you have specified within match that particular attachment. How to make a Global Filter apply to a single account? By default, global filters run for all selected accounts (when you select multiple@multiple from the Account dropdown in the main window). You can make a global filter apply only to a specific account by editing the rule and then clicking Add -> Filters -> Account filter as shown below. This will make that rule run only for that account. Once you have clicked Save, this will also show up in the main list. Each rule is run for every attachment from top down until a matching rule is found. The ordering of the rules in the global filters tab is important. Once a matching rule is found for a specific attachment or body, then NO other rule is run for that attachment or body. If the email has other attachments, then all rules are checked again. To move one or more rules, just drag and drop the rule or rules in the Global Filters tab. If you want certain attachments to be processed, then define global rules for those. But what if none of them matched? Since filters in the global filters are run top down and ordering matters, you can now define a catch all rule towards the end of the global rule filters list. This last rule will run when none of the rules above it have resulted in a successful match or download. That way, you can, for example, send an email to the sender indicating that their email did not contain the requested attachment or data. You can now enable or disable specific global filter rules. Just go to the global filter tab and then right click on one or more rules and then Enable or Disable them. Disabled rules will never run. The program starts downloading messages from an account from the start of time if it had never run a download from that account before. This is true even when Messages since last download was checked in the Search or Global Filters tab. If you want to change this behavior, you can set a Start Date above and also switch to Messages since last download in the Global filters tab. What this does is that for each account selected in the Account dropdown (or multiple accounts when using multiple@multiple selection), the program will only download messages from that start date onwards and will only check for new messages that have not been downloaded or processed by the program. How to save email attachments to folders.